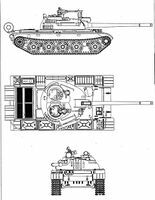 Der T 55A ist ein deutscher premium mittlerer Panzer der Stufe 9. Eine verbesserte Ausführung des Panzers T-55. Der T 55A hatte einen verbesserten Schutz gegen atomare Gefahren und kein Frontmaschinengewehr. 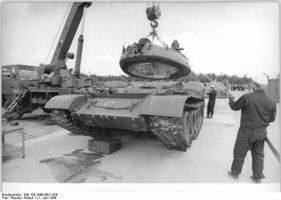 Von 1962 bis 1970 wurden 1.800 T-55 und T 55A von der UdSSR nach Ostdeutschland geliefert. 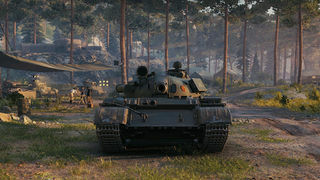 The T-55A is available as a reward for completing the third set of Personal Missions. 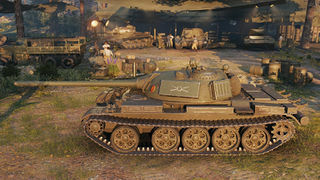 This tank is also unique for being the only tier 9 premium in the game. Bad gun depression and elevation. 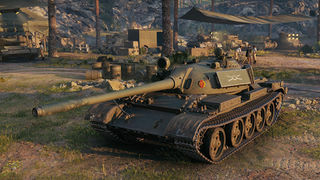 The T 55A is similar to the T-54 yet has more in common with the T-62A. The noticeably weaker hull armor doesn't allow you to be as aggressive as in a T-54, however your turret armor and side armor are the same so you still can sidescrape or stay hull down if possible and needed. Your superior gun handling gives you the edge and makes snap shots extremely potent and likely to hit even on the move. Therefore you should focus more on flanking and quick snap shots, however your short aim time combined with the very good accuracy also makes long range fights a real option. The reduced top speed in comparison is perceptible, but not dramatic - in most cases your quick acceleration and very good terrain resistance values make you just as mobile despite the considerably weaker engine. Diese Seite wurde zuletzt am 27. März 2017 um 10:43 Uhr geändert.